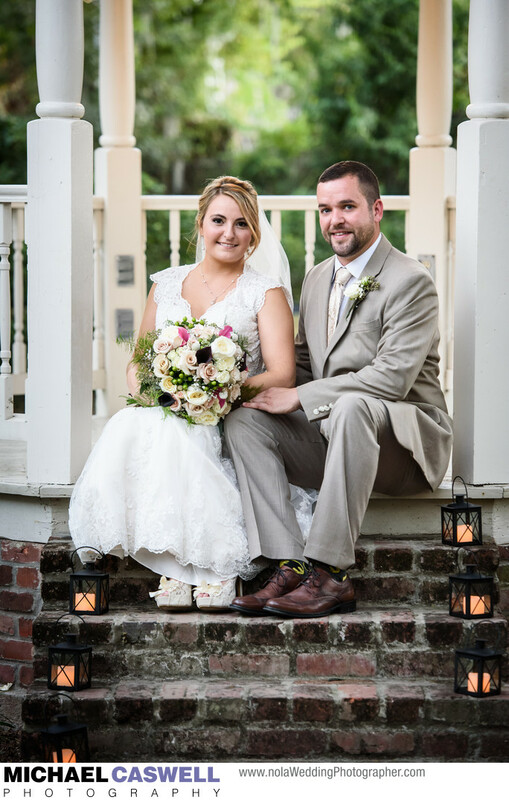 This couple's wedding took place at Maison Lafitte, a beautiful event venue located in Mandeville, Louisiana. Built around 1880, this Spanish revival bungalow is among the oldest houses in Mandeville and is listed on the National Register of Historic Places. It has served as a private residence for most of its life, recently having been turned into a wonderful northshore event space located just blocks from Lake Pontchartrain. Maison Lafitte is catered and run by the great folks behind The Lakehouse, another fabulous Mandeville wedding venue and restaurant. There are several different options for an outdoor ceremony here, such as the front steps of the house, the gazebo in the side yard, or, as was the case with this couple, the spacious pavilion behind the house. Last time I photographed a reception here a few years ago, this space utilized a tent and a temporary dance floor. But they have since added a permanent structure here, which while being of modern construction, perfectly matches the aesthetic of the main building, and seamlessly ties into it. Before the ceremony, the couple had their first look on the front walkway, and then we were able to capture some wonderful portraits around the grounds before it got dark, including this photograph by the gazebo that was on the bride's wish list. Location: 402 Lafitte St, Mandeville, LA 70448.